Death: May 22, 1911. Buried at Chestnut Level Presbyterian Church cemetery. Other Notes: Biography from Thompson family genealogy. 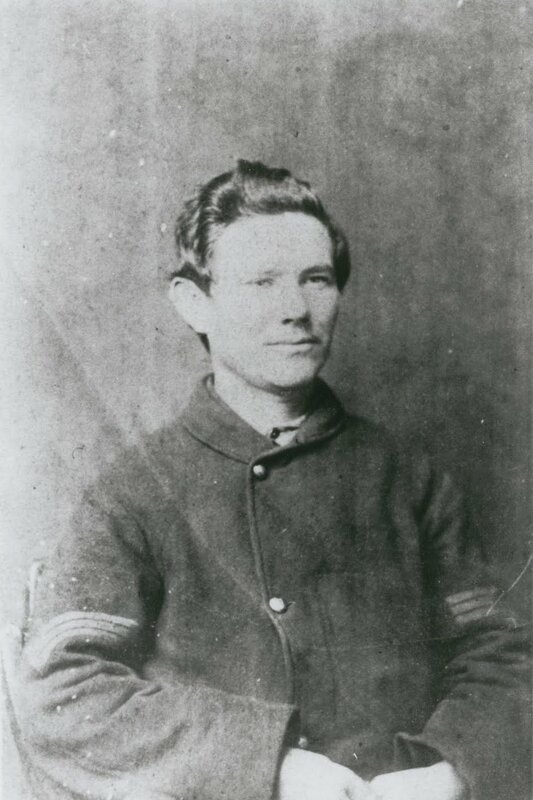 Today marks the 150th anniversary of the day that William T. Clark left his father's farm near Chestnut Level, Drumore Township, and traveled to Lancaster to enlist in a company being recruited by Capt. John Duchman. Shortly leaving Lancaster a couple weeks later, Clark began a diary in which he diligently recorded his thoughts and experiences as a soldier in Company B, 79th Pennsylvania. Very fortunately for us, Clark's diaries wound up at the Lancaster County Historical Society, and a helpful transcription exists thanks to the hard work of William G. "Jeff" and Janet B. Davis some twenty years ago. Detail of 1864 Bridgen Atlas of Clark's neighborhood, with many of these names appearing in his diary. 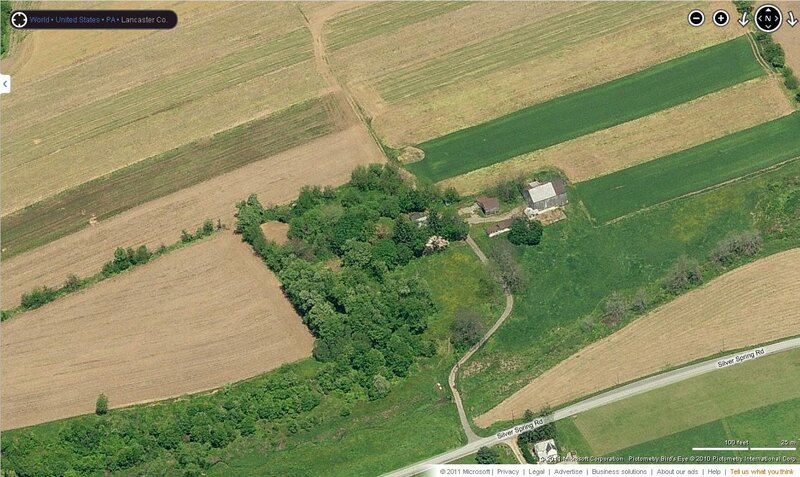 The farm of Thomas Clark appears in the upper-left quadrant of the map. Their immediate western neighbor's son, J. Kersey Hutton, enlisted in the 7th Pennsylvania Cavalry around the same time as Clark's enlistment, and Clark mentions seeing him multiple times in the field. Also, W. L. Lamborn had just been discharged from Co. E, 79th Pennsylvania, when the map was published in 1864. Clark was raised on his parents' farm near Chestnut Level, Drumore Township, in southern Lancaster County. The Clark family appears to have lived for about 150 years as part of a line of Scots-Irish families whom William Penn intentionally--as I understand it--settled amidst Quakers to assert Penn's version of his colony's border with Maryland. Clark was a devout Presbyterian and member of the Chestnut Level Presbyterian Church, and his diary records regular correspondence with the church's pastor, Lindley C. Rutter, while Clark was off fighting the war. In the early 1850s, Rutter, Clark's father, and a couple other community members established the Chestnut Level Academy, where William Clark attended school. Today I enlisted under Capt. John H. Duchman, who is organizing a company for Col. Henry A. Hambright Regiment. It is to be a “Rifle” Regiment. Our 1st Lieut. is David Miles, 2nd Lieut. is John H. Druckemiller, 1st Sergt. is Wm. S. McCaskey. Other Sergt’ s are Edwin Benedict, Wm. Blickensderfer, John B. Lebkicher & Wm. T. Rote. The three following weeks the Regt. was filling up its ranks & twice each day we were drilled in Fulton Hall, through the streets, or out on the Commons at the Locomotive Works. On the two first Sabbath days after my enlistment I was at home, attended church at Chestnut Level. On the third Sabbath (Sept. 29th) I attended the German Reformed Church & heard a Soldier’s Sermon by Rev. Mr. Slick. It was very good. Clark had apparently made his decision to enlist three days earlier while visiting relatives in his mother's hometown of Oxford, Chester County. On September 9, 1865, Clark reflected, "Four years ago this day at Oxford, Chester Co., Pa. my determination was made to enter the Army. Cornelius Collins, Jr. & R. B. Ewing were to go with me but they never went." Rev. Lindley C. Rutter, for fifty years pastor at Chestnut Level Presbyterian Church. He was a leader of thought and of men. In the promotion of temperance, aggressive warfare upon slavery and zealous support of the Union, during the War of the Rebellion, he was conspicuous. A month before enlisting, Clark would have also witnessed neighbors and church members gather down the road at Drumore Center for an anti-war Democratic Party meeting, which generated attention and controversy in the Lancaster newspapers. 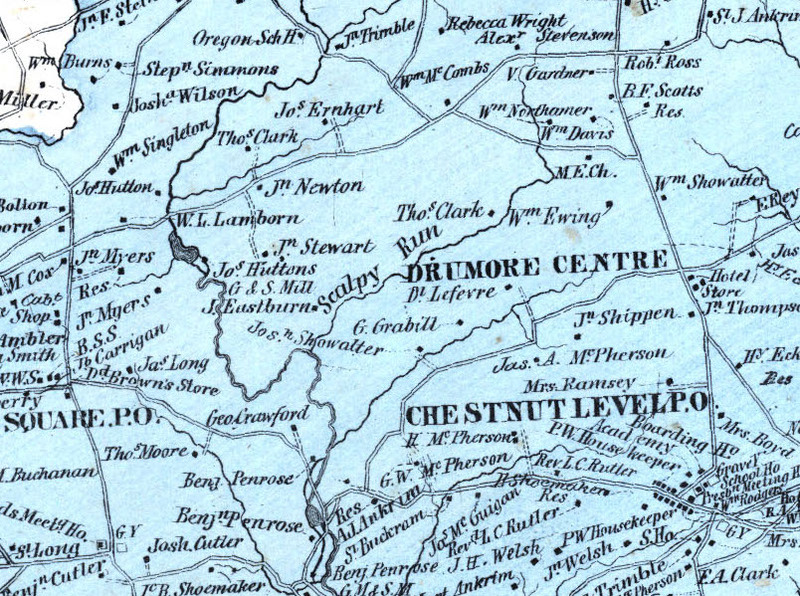 An account of the proceedings, and the Union counter-meeting led by J. R. Sypher, appear here (scroll down to "Democratic meeting in Drumore"), and the resulting controversy was what prompted my "Introduction to Newspaper Quarreling" post a couple weeks back. The Democrats' resolutions included "“Resolved, That we are in favor of a cessation of hostilities until another effort be made to restore peace and prosperity to our beloved country, by some such compromise as the [Crittenden-style compromise mentioned elsewhere]." As the war carried on, Clark displayed less and less tolerance for such "Copperhead" sentiments. Clark fought with the 79th Pennsylvania for the regiment's duration, save for an unsuccessful trip back to Lancaster during the Gettysburg Campaign to recruit a militia company. He was in the middle--technically, on the left, where Company B was positioned--of the regiment's three toughest battles at Perryville, Chickamauga, and Bentonville. At Perryville, he was wounded three times but stayed with the regiment until the fighting ended. Clark tended to put battle details into letters (of which we have a couple, including here) instead of his diary, but his diary is still remarkable for what we can learn about the regiment's daily events and operations. Especially interesting are his entries for the four months after he returned to Lancaster, where the 79th Pennsylvania was mustered out in July 1865. Clark immediately returned to his father's farm, "[pitching] five loads of oats on & four off the cart" the day after muster out, and resuming other activities such as attending church, visiting family, and dating "Miss Jenny" (Jane Porter Evans), whom he would marry in 1868. Winslow Homer's "The Veteran in a New Field," 1865. 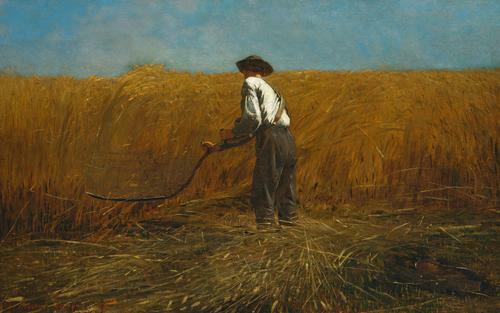 Clark's writings of July-November 1865 acutely remind me of Winslow Homer's work, "The Veteran in a New Field," which he painted during the same time period. It depicts a recently-discharged veteran cutting a lush field of wheat with a scythe, his jacket and canteen lying in the foreground. One meaning of the painting is an optimistic outlook on the soldier's return to civilian life and prosperity now that the war's cruelty has ended. Sat., Aug. 19th: This morning I go to Aunt Eliza’s and take the girls to closing meeting of the Soldiers of Aide Society of Fulton Twp. Miss Lib J. Neeper came to Uncle Scott’s at Noon on the 17th inst. on a visit. She is just returning from Baltimore Co., Md. Father & Mother with Uncle Scott & Aunt Isabel went to Aunt Polly’s funeral. The Fulton Aid’s meeting is pretty well attended. The speakers were Rev. L. C. Rutter & --- Torbet, Esq. of Elkton, Md. Others were to address the meeting but for some reason failed to do so. I receive an invitation to & eat dinner prepared by the “Ladies Aid”. I am not very well. Take Cousins home & come to mine, when our family & Uncle Scott’s visit Rev. L. C. Rutter’s. Fri., Sept. 1st: One year ago today we fought the Battle of Jonesboro, Ga. & drove the Rebels in confusion from their works, this gave us Atlanta. Last night Coz.s. Lou & Wilma Morrison were with us. This morning I went to Aunt Eliza’s. She & Coz. Annie go to Church at Chestnut Level. I do not get there untill afternoon. Rev. Mr. Pharquar preaches. After sermon is over I start to Lancaster. Tis 3 P.M., get there ¼ --6 P.M., get 2½ bushels Timothy seeds for Aunt Eliza. Met Capt. [William] McCaskey. He has not been very well. We were very glad to meet each other. Tis our first meeting since we came home. Bought gold watch key at Zahm’s for 2.75$. Start home at 7.20 P.M. & arrive at 10½ P.M. The meeting this afternoon & evening has been very interesting. God’s Spirit has been striving with the souls of men. 30 persons have been inquiring the way to Heaven, among are my Sister Rettie, Bros. John & Charles, Rachael & Lorenza Clark & Lin. Rutter. May God grant them that peace of conscience & joy in believing which He also can give. Wed., Sept. 20th: Two years ago on Sabbath we were forced from the bloody field of Chickamauga. We had taken our position at 3 A.M. & held it, although nearly surrounded untill 5 P.M. when we had to fall back—the remainder of the Army all being gone and we nearly captured. We all are taking up potatoes but Father who is cutting up corn. Potatoes are turning out very well, a few are rotten. Meeting for Inquiry at C. L. Church at 2 P.M. John, Charles, & Rettie attend. After Tea I go to Mr. James Evans’ Sr. & take Miss Jenny to Little Britain Church. Mr. Alexander preaches. On our return to her home we find Mr. Ross McCommon there in company with Miss Bell Evans, Jennie’s Sister. Sun., Oct. 8th: Tis 3 years ago today since we fought the battle of Perryville, Ky. in which I was wounded 3 times. Bro. John & I went to Little Britain Church today. Tis quite warm untill Noon, somewhat cooler in afternoon. Attend Young Men’s Prayer Meeting at 5½ P.M., attendance not so large. We felt the precious presence of Jesus there. Congregational Prayer Meeting in Church at 7 P.M. Not many out. Look for much more from Sgt. William T. Clark and some of his friends, such as fellow Company B officers John H. Druckenmiller and William McCaskey, over the next couple years.